Price defended the American Health Care Act, the House GOP plan to overhaul the health-care system, in an interview with CNN. We’re going to focus on two statements in particular because they are rather misleading. Debates over a baseline are an old Washington tradition. The CBO calculates what would be necessary to maintain current services over a 10-year period, accounting for inflation, population growth and so forth. One dollar in 2026 will not go as far as a dollar in 2016. Here’s our favorite example of this phenomenon: Defense spending technically remained constant from 1987 to 1994 — $282 billion a year. But look what happened to the military during those seven years: The number of troops fell from 2.2 million to 1.6 million, the number of Army divisions was reduced from 28 to 20, Air Force fighter wings dropped from 36 to 22 and Navy fighting ships declined from 568 to 387. That’s because inflation over time ate away at the value of those dollars. By most measures, defense spending was trimmed in that period, although in theory, not a penny was cut. What happens in 2020? Currently, the federal government pays for a portion of the cost of Medicaid, at least $1 in matching money for every $1 a state spends on Medicaid, with 90 percent of the costs if a state expanded Medicaid under President Barack Obama’s Affordable Care Act. At one point, Price assured Tapper that it was “absolutely not” true that people would lose Medicaid as a result of the spending reductions. This is a misleading talking point we have dissected before, but simple math explains why this is false. People cycle on and off Medicaid on a regular basis. If they try to return to the program once the AHCA takes effect, they will have lost their grandfathered status. Price flatly said that “20 million folks” choose to pay a penalty because they wanted nothing to do with Obamacare, although if you listened carefully you might have noticed a small caveat at the end of his spiel. But this is wildly inflated. According to a Jan. 9, 2017, letter from IRS Commissioner John Koskinen to Congress, only 6.5 million taxpayers paid the “shared responsibility” payments in 2015. That’s actually a decrease from 2014, when 8 million taxpayers made a payment. The payments in 2015 totaled about $3 billion, with the average payment about $470. Many people probably paid a penalty for only some months, not an entire year. The Congressional Budget Office estimates that, on average, about 3 million people will pay the penalty for being uninsured in any given month in 2016. Notice how Price slipped in the word “waiver” at the end? He gets to 20 million by adding in people who received an exemption; that totaled 12.7 million taxpayers. But Price framed this as some sort of mass protest against the law (“phooey, nonsense”). When you dig into the data, that’s not the reason. Exemptions are granted for a number of reasons, but the most common one is that a person has income below a certain threshold and lives in a state that did not expand the eligibility for Medicaid. (The law offered Medicaid to nearly all low-income people with incomes at or below 138 percent of poverty, or $27,821 for a family of three in 2016). In other words, this is the result of the Republican governor or legislature refusing to accept the expansion. The second most common exemption is if a citizen lives outside the United States. People also do not need to pay a penalty if they would have had to pay more than 8.13 percent of their income (in 2016) to obtain health insurance. President Trump engaged in similar gamesmanship with this figure and administration officials really need to start citing the data accurately. 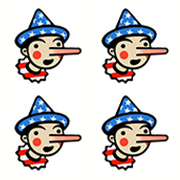 Price flatly stated that Medicaid spending will go up year after year in the budget, but that’s false. It actually declines in raw dollars after the switch in funding is implemented. Although HHS suggests he was saying that spending would go up by the rate set in the law, that’s still misleading. That’s a fixed amount untethered to the actual expenses of patients, so if the money falls short, states will either have to make up the difference or cut expenses by limiting enrollment or reimbursements. Price is similarly misleading when he declares that 20 million people have rejected the Affordable Care Act by paying a penalty. He slipped in the word “waiver” at the end, but that’s still misleading because most of the exemptions granted have little to do with “a clear indictment of the law.” It’s disturbing that Price’s spokeswoman would double down on the claim even after we pointed out the facts. People who live in non-expansion states or overseas are not writing off the law; in fact, the number of people paying a penalty actually declined by nearly 20 percent from 2014 to 2015, indicating greater acceptance of Obamacare. in a interview on CNN’s "State of the Union"